Last week, I was working with a client on a web-filtering solution, using one of their organization's laptops. We happened to notice the long-long-LONG list of SSIDs that were on this machine, may of them open SSIDs. The host we were looking at had the default "dlink" and "linksys" SSIDs as auto-connect, so not a great situation. Coincidentally, this was the same day Xavier posted his diary about collecting this same information (the ssid list) from live machines (https://isc.sans.edu/forums/diary/How+was+your+stay+at+the+Hotel+La+Playa/22069/). It really seems like people still have a pathological need to connect up to free WiFi. netsh wlan show profiles name=PROFILENAME to get the details for the profile "PROFILENAME"
Combine that up with psexec (because psexec *always* works - well, almost always), and some text manipulation, and you have the code below. Yes, I do know that this could have been done by pulling everything out of the registry, but in this case perfect is the enemy of "done" - I had a few clients who wanted this done quickly, and this approach got it done in that "quickly" time frame. The resulting script will list all wireless profiles across an AD domain. I did have a "test connection" line in there, but enough organizations have ping disabled now that I took that out. How to use this information? For most organizations, this is a chance to do some outreach, some end-user education about safer computing. In most cases, this means that we recommend that they tether to their phone rather than connect to random free SSIDs. In a more security conscious environment, say if it's a bank or if clearances are involved, what this can be used for is as a simple audit. 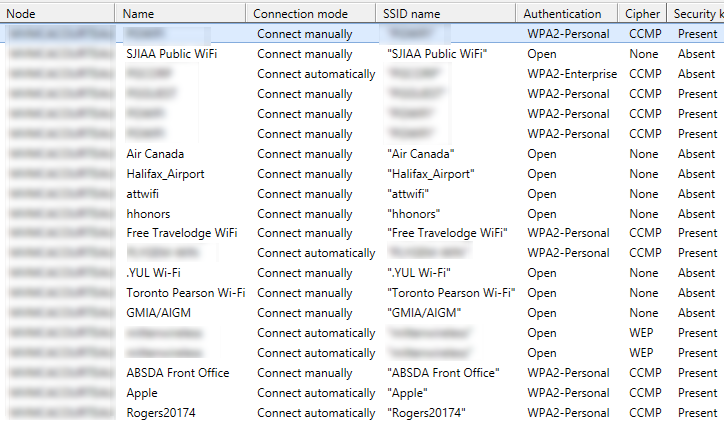 In higher security shops, it's more common to see Group Policy be used to say "only this short list of SSIDs are permitted", where the list is the organizations' "real" wireless networks, as well as (in some cases) a pre-configured cell phone "tethered" network. As always, let us know how this code works out. There are a few errors I'm still trying to suppress, and it can take quite a long time to run this, but the clients that I've used this with have gotten good use out of the information. $netlist = iex ("./psexec /accepteula \\"+$node.name +" netsh wlan show profiles") 2>./a | Select-String -Pattern ": "
$cmd = "./psexec /accepteula \\"+$node.name +" netsh wlan show profiles name="+ "`'"+$netprf+"`'"
$t1 = $parm -split ": "
Thanks, when you're in a hurry sometimes you miss obvious things (or at least I do). I'll post an update to github.com/robvandenbrink/… (for "Off Premise Wireless") tonight or tomorrow. I should also be able to nail down the errors in that "add-member" loop. Quoting Rob VandenBrink: Thanks, when you're in a hurry sometimes you miss obvious things (or at least I do). The following command was not found: wlan ?. Microsoft's current best advice is to use psexec. Unfortunately, most larger orgs aren't running Windows 10 across all workstations (yet). I have collected this information from Windows machines as well using COM. In particular what I think is vital is the GetDomainType() call. I find many users do not understand the difference between Private and Public networks. Many users I have been responsible for think "Private" means they want the network to be private, and don't understand that selecting Private means it is supposed to already be private. Updating the $cmd line to use double quotes to enclose the network name should help. $cmd = "./psexec /accepteula \\"+$node.name +" netsh wlan show profiles name="+ "`""+$netprf+"`""